Why do states collect education data if they won't use it properly? I found myself asking this question once again this week as I read through a "Comment/Response Form" put together by the New Jersey Department of Education and released earlier this month. The form was in response to the state Board of Education, which is evaluating a series of changes in charter school regulations. 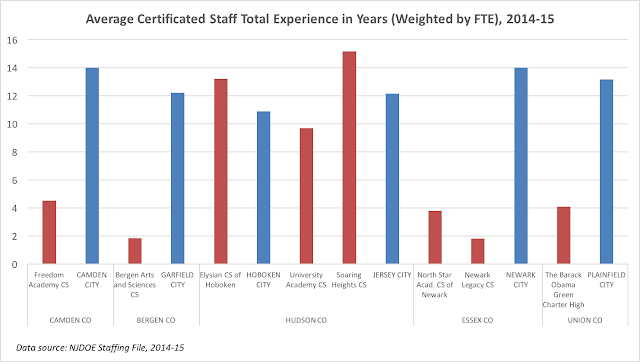 Those changes, as I wrote in my last post, include loosening certification requirements for charter teachers. The rationale for this, according to the state's charter cheerleaders, is that charters "do more with less"; in other words, they get better results and spend less money than public district schools. Chris Christie has repeatedly made this case in his push for the disastrous "Fairness Formula," which would rob urban districts, serving many more disadvantaged children, of necessary state aid. Christie points to the alleged efficiency of charter schools to justify these cuts: if they can "do more with less," why can't the district schools? RESPONSE: The proposed amendments to N.J.A.C. 6A:26-7.5 will not affect per pupil costs for students attending charter schools. 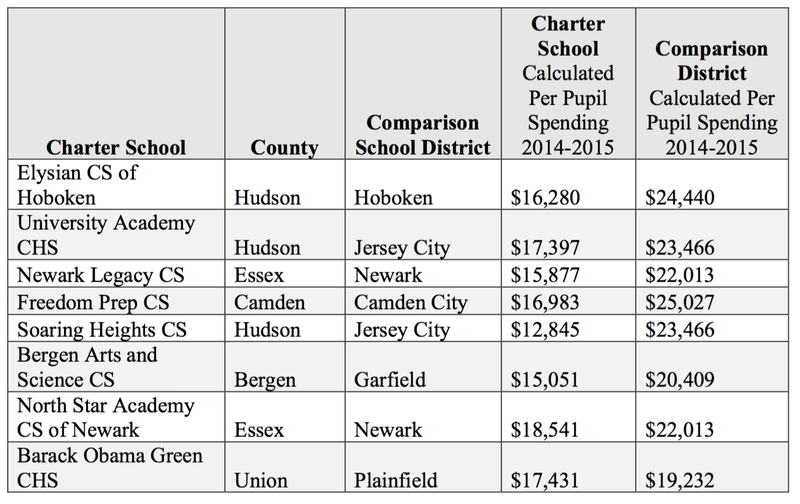 Wow, look at that -- see how lean and mean the charter schools are compared to their hosting public district schools? Chris Christie must be right; the charters "do more with less"! We should be letting them open up all over the state! A SHORT GUIDE TO COMPARING CHARTER AND DISTRICT PUBLIC SCHOOLS CORRECTLY. 1) When comparing the spending of two school authorities, do not include services one provides for the other, or for the community at large. 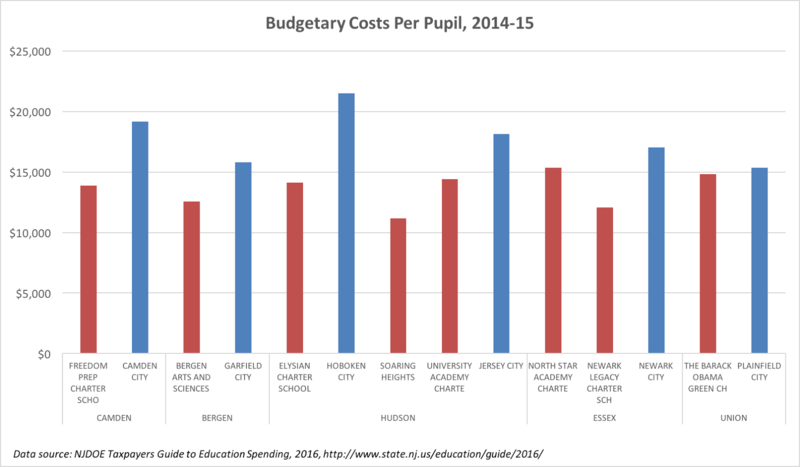 The figures in the table above come from the NJDOE's Taxpayers' Guide to Education Spending. 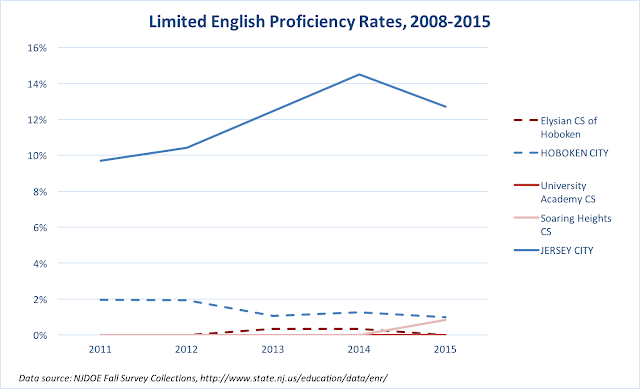 Yes, that's right, this is the state's own data. The figure used in this comparison is "Total Spending per Pupil, 2014-15." How does this state define this figure? This simple explanation makes clear that school districts provide many services that charter schools do not; it is, therefore, inappropriate to compare their costs. Take transportation: the total spending figure NJDOE uses for host districts includes the transportation costs for students attending charter schools. But why should a district have that counted in their comparative budget, but not the charter school whose students use that service? The district pays certain costs to students who attend private schools; again, charter schools don't have to worry about that cost. The school has to pay legacy debt costs, meaning its budget includes students who have already graduated and left the district. Why should that be included in a comparison of current expenses? For that matter: if the community uses school buildings for a variety of reasons outside of school, why should the cost of maintaining that building only be put on the host district? Charter schools also tend to enroll students in the lower grades, and many don't enroll pre-K students. How can we then compare the spending patterns of charter and district schools when grade level expenses aren't necessarily the same? BPP isn't perfect (for example, it doesn't address the grade level issue), but it's much better than Total Spending per Pupil. How do the charters and the districts compare on this measure? 2) When comparing the spending of two school authorities, you must take into account differences between their student populations. 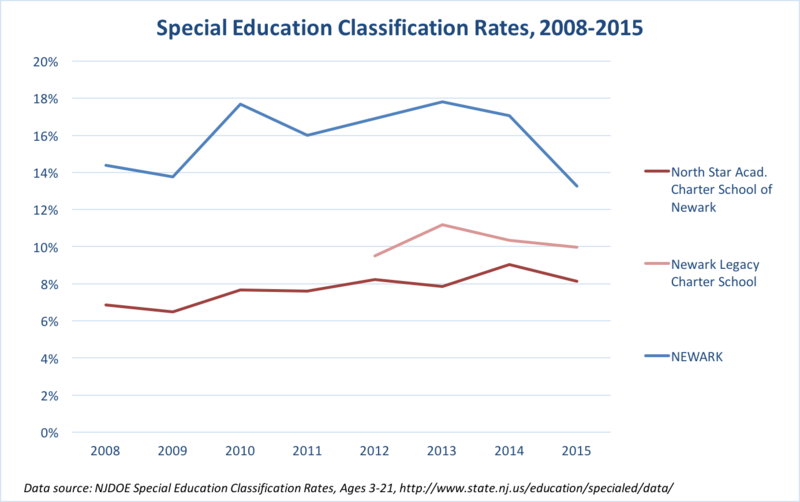 As I've pointed out literally dozens of times: Charter schools, on average, do not serve nearly as many special education students as public district schools. 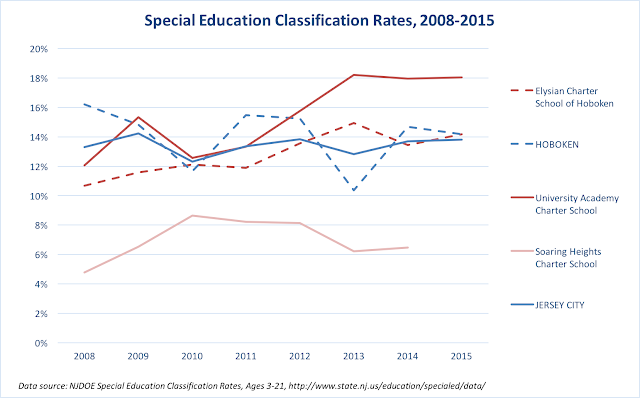 Everyone acknowledges it costs more to educate a child with a learning disability; even Chris Christie doesn't argue that point! 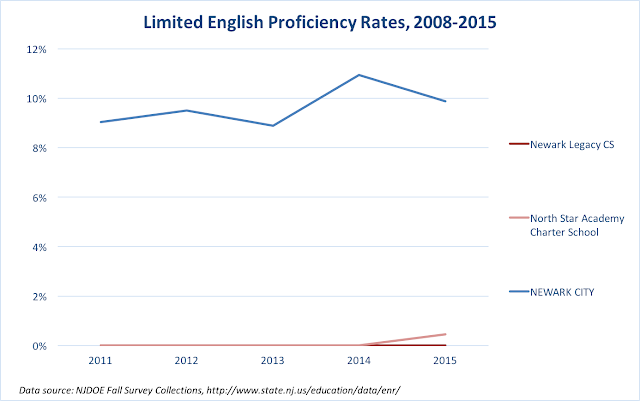 And yet NJDOE made their little table without even acknowledging this glaring problem with their comparison. Of course, the special education gap varies from city to city. The data for Freedom Academy in Camden are clearly very noisy, but the overall trend is clear: charters don't serve nearly as many special education students as public district schools. In Hudson County, however, the story is more complex. 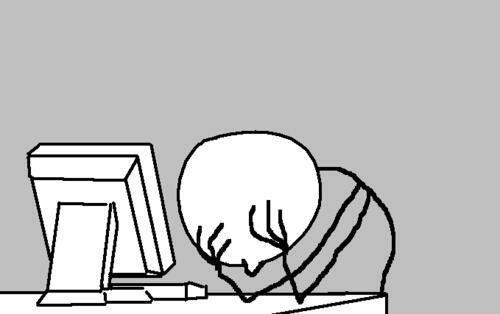 3) Always acknowledge the limitations of crude data. A "specific learning disability" is a lower-cost classification, unlike, say, autism or a visual impairment or a traumatic brain injury. 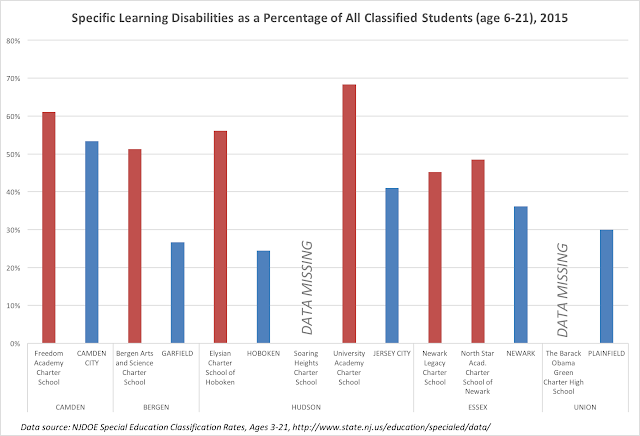 For both Elysian and University Academy, the majority of their special education students are SLD; that's not true for their host districts. * So the public district schools are enrolling more of the students with costly disabilities compared to the charters. That explains a good part of the cost differential, as we'll see below. 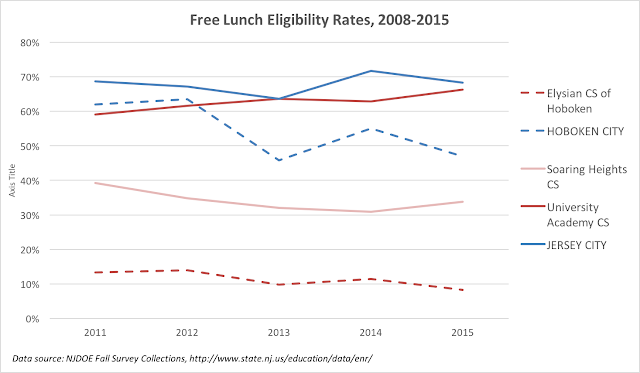 To be fair: Jersey City Public Schools has a free lunch-eligible (FL) rate equivalent to University Academy; Soaring Heights' rate, however, is much lower. FL is a crude proxy measure for economic disadvantage, but it's the best one we've got. 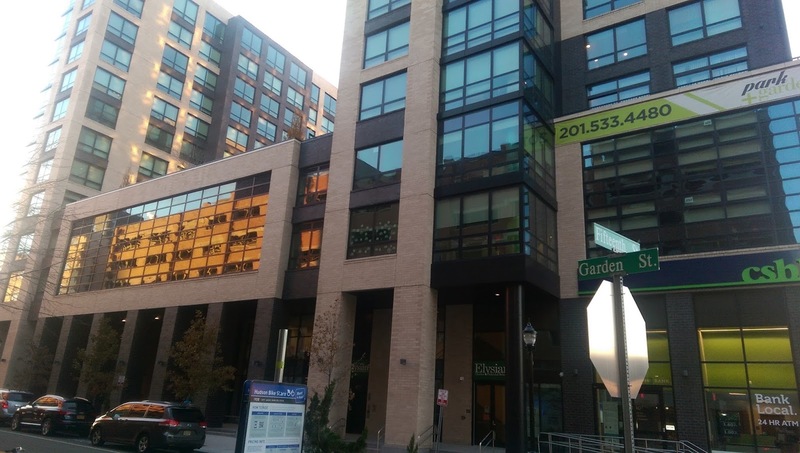 In Hoboken, the difference between the public district schools and Elysian is very large. Again: schools are supposed to get more state aid when they enroll more FL students, because everyone acknowledges it costs more to equalize educational opportunity for disadvantaged children. Of course, if the charter cheerleaders don't agree, their beloved charters should stop taking more money for enrolling more FL students. Think that'll happen? 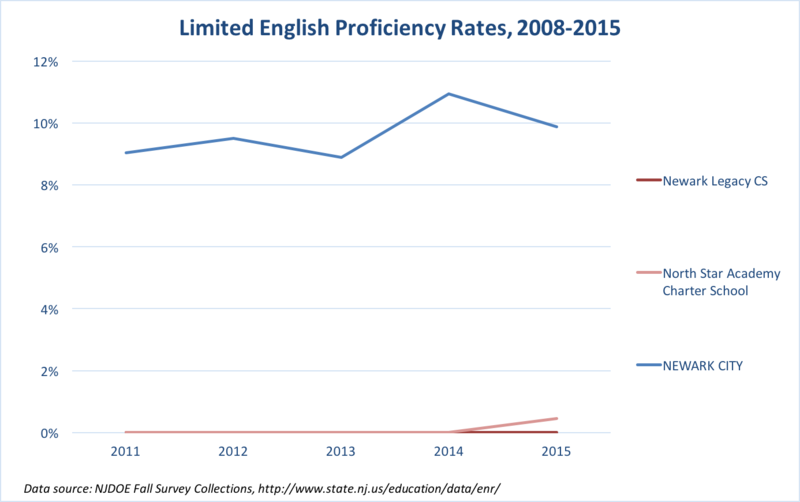 Across the state, the education of children who do not speak English at home has been left to the public district schools; the charters have taken a pass. Once again: schools are supposed to get more state aid when they enroll LEP students, because it costs more to educate them. Ignoring this reality when comparing charter and public district school spending leads to a flawed analysis. 4) Remember that education is a human capital-intensive enterprise. Support services include many functions, like child study teams, that are necessary for schools with special education students. It's obviously a significant part of a public school district's budget -- but not a charter school's. Those zeroed out column above aren't missing data; they're showing charter schools who simply don't report any spending on support services. 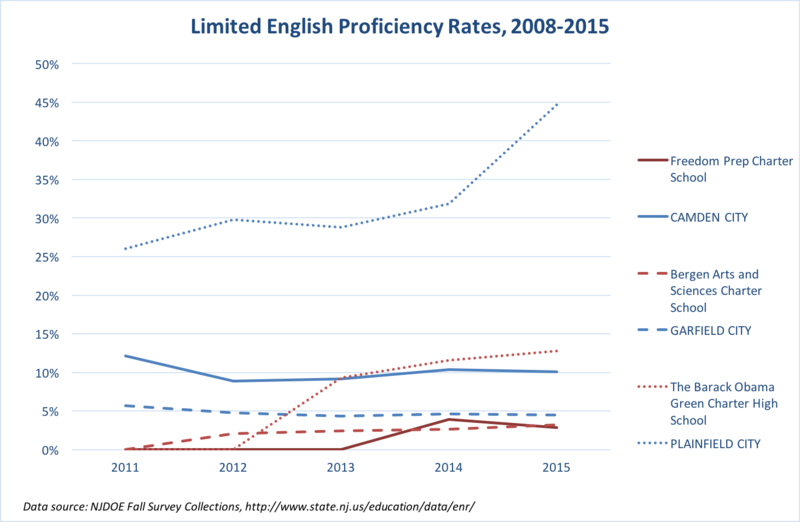 I've always urged caution when interpreting these figures, because there may be reporting differences and data error. 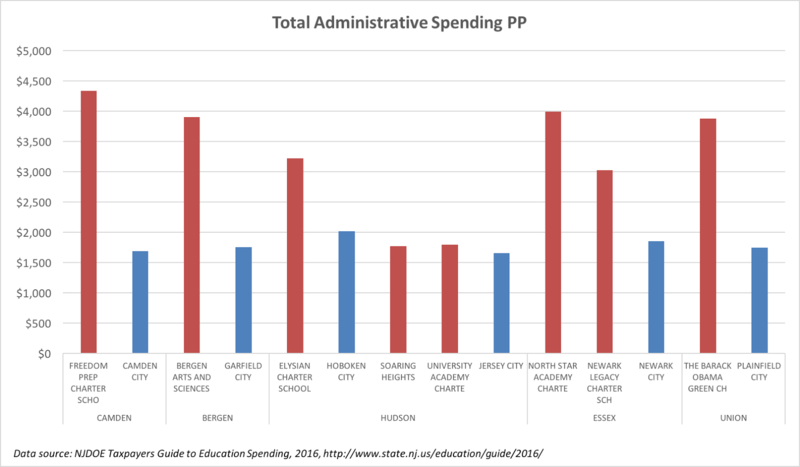 At this point, given year after year of data, there is just no question about it: Charter schools spend, on average, much more on administration than public district schools. It just makes sense: as Bruce Baker points out in his latest report (which, sadly, has been completely misinterpreted by the usual suspects), small charter schools can't leverage economies of scale, and that manifests, to a large extent, in administrative costs. 5) Remember: it's easier to keep costs low when you have an inexperienced teaching staff. One of the truly foolish things I hear from charter cheerleaders is that charters are taking advantage of millennials' alleged desire for temporary careers. First of all: we know experience matters, especially in the first few years of a teacher's career. 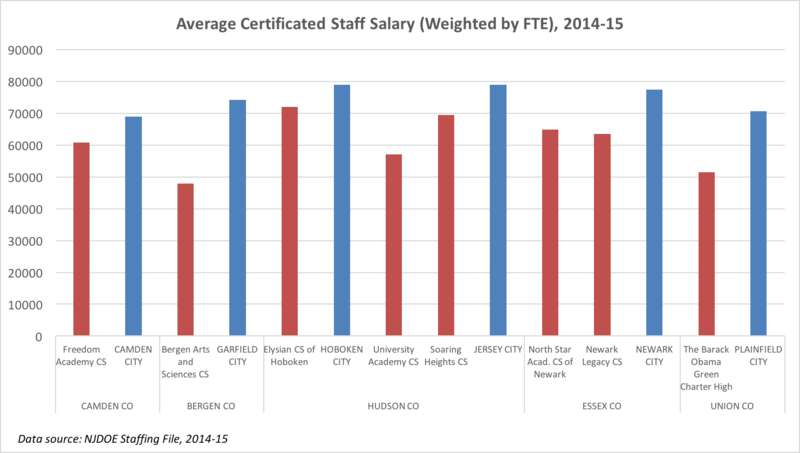 Why, then, would it be a good thing to have charter schools where the average teacher's experience is less than 2 years, like Bergen A & S and Newark Legacy? On average, charter school teachers make considerably less than their public district school counterparts. As I've noted before, this difference holds even when accounting for differences in experience. Look, if charter cheerleaders want to brag on "doing more with less," then fine: acknowledge you're doing that, in part, by paying your teachers less. Then explain to the rest of us how that's a good thing for the profession. This is a technique I've used before: looking at the staffing files to determine the extent of programs in areas like music. The first thing to look for is whether schools actually have teachers in these specialist areas: in the case of Newark Legacy, Soaring Heights, and Freedom Academy, the staffing files suggest music just isn't a part of those charters' curricula. 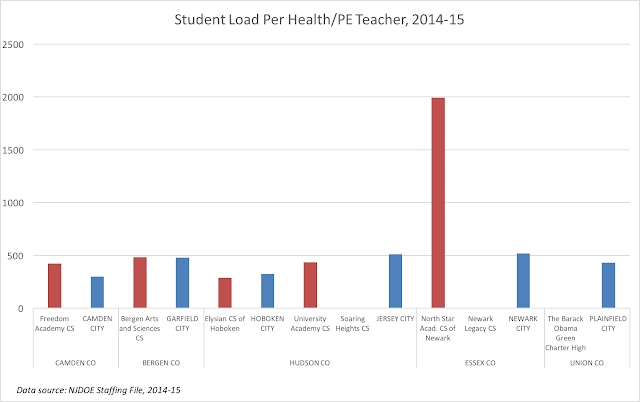 The next thing to watch is how many students each specialist teacher has for their "load." At North Star -- which compares itself to the most affluent suburban districts in the state -- the music teacher has a much greater student load than music faculty in the Newark Public Schools. That means it's much less likely North Star has the bands and choruses and orchestras NPS can offer their students -- they just don't have enough teachers to make it happen. That said, it's a mixed bag. 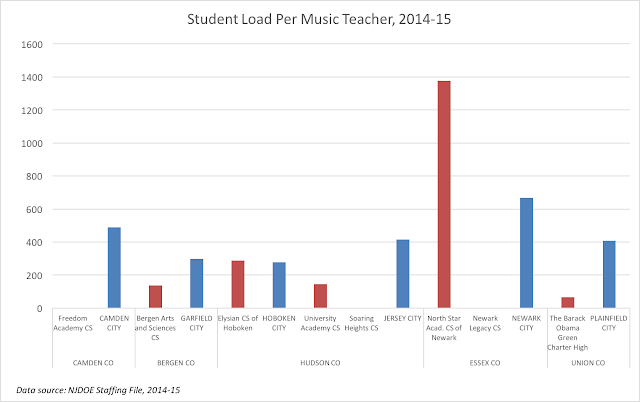 Some of the charters do quite well on music; how do they do in other areas? As I have said, many, many times on this blog: I really don't have a problem with charter schools per se. I started my career in a charter. I have seen first-hand that some kids just don't thrive in a "regular" public school, and might do better if given a "choice." We can and we should try to innovate in our schools. But let's not fool ourselves about how and why charter schools "do more with less." 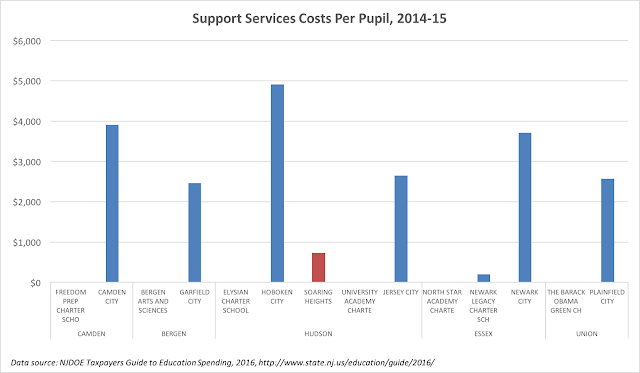 Advantages in student populations; advantages in staffing costs; unequal curricular programming and support services: these are the reasons for the differences in costs between charters and district public schools. Keeping this in mind, let's step back a bit and think about how I did this analysis. This is all based on data collected by the NJDOE. The reason they collect the data, supposedly, is that they can then analyze it to present to policy makers -- like the state BOE -- so they can make good decisions. But that is most certainly not what happened here. Instead, when a member of the board asked a reasonable question,** the NJDOE gave a facile, cursory answer that matched Christie's ideological predilections. That is a very bad way to make policy. It's a disservice to the many students and families in this state who are looking for better education and better schools. It's an abdication of the duty a state department of education has to the citizens of its state. There are some really good people at NJDOE, as there are at all the state departments of education. But too many ideologues are at the top, and they are failing in their jobs. Step up, folks. Do the work. 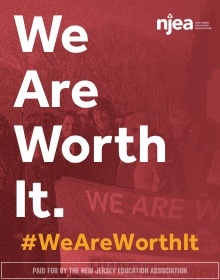 ADDING: One thing I didn't get to -- and I will get to this one day in a comprehensive way, I promise -- is how charters like Elysian benefit from substantial philanthropic giving. * There's a lot of suppression in the special education data, ostensibly to protect the privacy rights of classified students. 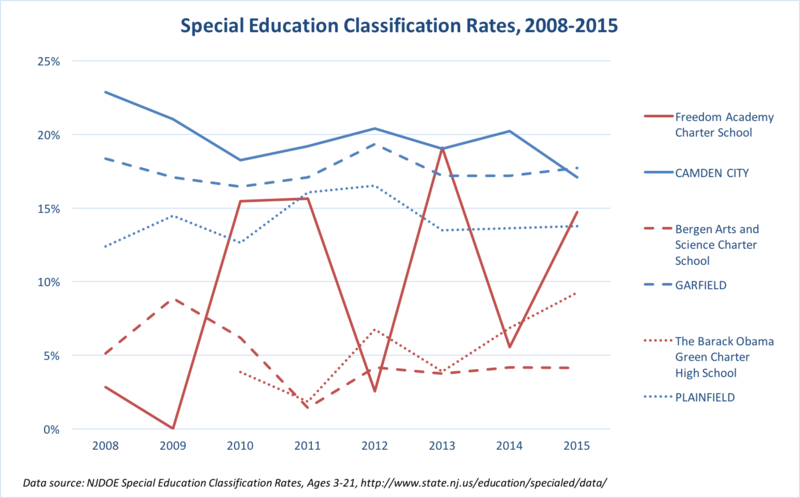 It's so prevalent that I really couldn't make useable graphs for speech disabilities, another lower-cost classification. SLD is more important for this discussion, however, because charter schools get more funds for enrolling non-SPL classified students -- but there isn't a distinction between SLD and other higher-costs classifications when the aid calculations are made. This is a complicated topic I get into more here. ** Well, somewhat reasonable: why ask for just a sample of charters? Why not analyze all of them? It's not impossible -- I did it. In fact, why not ask someone like me, who's already done the research, to answer the question?